The BBC Radio 4 adaptation of Life and Fate is in full swing, but I’ve been away/really busy, so I haven’t managed to listen to any of it yet (perhaps later today, if I finish the article I’m working on…), or write the follow-up post I was intending about the conference. But as Grossman mania sweeps the country (okay, that may be a slight exaggeration), I can at least provide a few links to round up the best offerings on the web (this is clearly displacement activity, as I really should be trying to finish that article). Grossman’s works: Many of the original texts can be found on the inevitable Biblioteka Maksima Moshkova (where would we be without it? ), but apart from ‘The Hell of Treblinka’ (which for some reason is categorized as a povest’), it doesn’t include much of his war writings. For some these go to the Voennaia literatura website, where you will find War stories and Sketches, Years of War (in RAR format – to extract the files, use unrarx for mac, 7-zip for Windows), and For a Just Cause. English translations of a small number of stories and reports are available on SovLit: In the Main Line of Attack, In the War, In the Country, A Tale about Happiness, and The Resident. But of course, if you haven’t already discovered Grossman, you should read Robert Chandler’s translations, Life and Fate, Everything Flows, and The Road, and Anthony Beevor/Luba Vinogradova’s A Writer at War. Other resources: For Russian readers, there are various links here on Grossman’s life and works. There’s brief biography on SovLit and an essay on The Berdichev Revival. 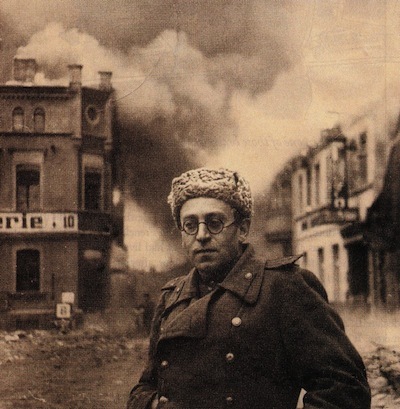 The website of the Centre for the study of Vasily Grossman, Life and Fate and the Battle of Stalingrad in Turin brings together various resources, and is is playing an increasing role in promoting the life and work of Grossman, by coordinating publications and conferences, and through its travelling exhibit. On Life and Fate – the book and the adaptation: Among the many pieces that have appeared to accompany the production, see Anthony Beevor in the Radio Times, a preview and review of the first plays in the Telegraph, reviews of the adaptation in the Economist and the book in the London Review of Books, and an article on Grossman and the adaptation on Prospect – there’s also an earlier essay by Robert Chandler on Grossman and the novel for Prospect. In the last couple of weeks, the Guardian has published a number of articles and comment pieces, including and article by Francis Spufford, Pass Notes on Life and Fate, In Praise of Life and Fate, and a review of Journey, the fifth play of the adaptation, which follows Sofya Leviton into the gas chamber. Previous pieces include this article by Luke Harding on Grossman’s life, work and reputation. Keith Gessen’s article in the New Yorker is good for background. Among the blogs, Trewisms has good posts about the novel both in response to recent events and previously, as well as commenting on the Grossman-fest in Oxford. See also Shiraz Socialist, and openspace.ru for a Russian perspective on the sudden growth of interest in Grossman in Britain. A new blog, The Faculty of Useless Knowledge, has also written about the meaning of the ‘arrest’ of the novel. Other stuff: Reviews of Robert Chandler’s translation of Everything Flows from the Independent and the Los Angeles Times, plus a couple of essays by Robert himself on Grossman and the novel from Vulpes Libris and the Book addict’s guide to good books. Robert’s article on translating in this week’s New Statesman arose out of concerns about the lack of recognition given to translators – including the BBC’s failure to give proper acknowledgement to him as the translator on which their adaptation was based until a campaign rectified the situation. The Independent also reviewed The Road, Robert’s collection of Grossman’s short stories and essays, and to mark the publication of that volume, I published an interview with Robert Chandler. I just started reading the book (I’m hooked) after listening to a little of the broadcast. Now downloading all of the episodes to listen to after I finish the book. Thanks so much for all the links! I hadn’t seen the Faculty of Useless Knowledge post, so have added it to the list – thanks! Was it just me? I’m afraid I found I couldn’t listen to the Radio 4 adaptation of Life and Fate after having been able so very powerfully to imagine the characters in all their ‘Russian-ness’ when reading Robert Chandler’s translation. I read it only about 9 months ago so it is still very fresh in my mind, and I just found the radio characters incredibly ‘English’ in the way that only radio drama (and particularly Radio 4 drama) does them – accents especially but a whole manner as well somehow. Adopting fake Russian accents would be ridiculous and patronising (wouldn’t it?) so I don’t know what the answer is to this or any other adaptation, but I do know it grated terribly against what was in my imagination, to the extent that I had to switch it off. Maybe the fact that I am Welsh has something to do with it, I don’t know, but did anyone else have this unfortunate experience? Thanks Sarah for this treasure trove of links. Is there a copy of For A Just Cause in English anywhere? I would love to read it, but have not been able to find a copy. there is no translation of For a Just Cause into English at the moment, but I do know that one is in progress. I’m not sure when it’s due out, though. Do you have an update on the English translation of For a Just Cause? Is Robert Chandler doing the translating? Yes, he is translating it, but I’m not sure where he’s up to. I’ll ask him next time I see him and will update then. Thank you. Looking forward to hearing more on this – and eventually reading the book.